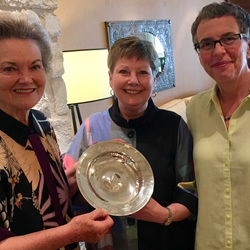 The Robin Tavistock Award is presented annually to a person, or group, who is inspirational and has made a significant contribution to the field of aphasia. The Trustees are delighted to announce that Professor Nina Simmons-Mackie is the recipient of The Robin Tavistock Award this year. As a clinician, Nina came to realise that for those with aphasia, the traditional methods of approaching therapy only went so far. She came to understand that people with aphasia often felt safe whilst having therapy, but were less confident ‘out there’ in society. A different and innovative way of thinking about, and approaching, speech and language pathology was necessary – even essential – if people with aphasia were going to fully participate in life again. For Nina, finding ways for people with aphasia to fully access life became an enduring passion and mission – not only to help people improve their language, but also the quality of their lives, within their social setting. Nina’s academic research focused on social model approaches, putting the person with aphasia, and improving how they lead their lives, at the centre. Nina was also convinced that healthcare professionals needed more support in knowing how to care for those with communication difficulties. Along with others, Nina founded Aphasia Access and in 2014 became its first President. Aphasia Access is dedicated to ensure ‘communicative access’ for all who have aphasia so that they are no longer excluded from decision making and participation. Aphasia Access provides resources and education for professionals, increases awareness and provides tools to support those who help people with aphasia. It is not possible to list all Professor Simmons-Mackie’s achievements here. What is striking about Nina’s career is how it straddles so many strands of the aphasia world. Nina has made a significant contribution as a clinician and to academic research, through her work at the Southeastern Louisiana University, and she is known to be a generous mentor for others. She has also played an important role in a number of organisations, such as the National Aphasia Association, the Academy of Neurologic Communication Disorders & Sciences and, more recently, Aphasia Access. Nina is known for her quiet yet authoritative leadership, her strategic research and her gift for being able to go directly to the heart of a problem and apply her unerring wisdom. This is coupled with warmth and kindness, as well as a keen sense of humour. 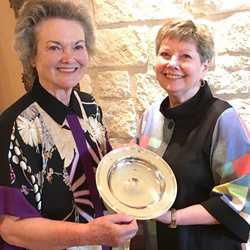 It is for her outstanding contribution to the world of aphasia that Professor Nina Simmons-Mackie is being honoured and is the first ever recipient of The Robin Tavistock Award from the United States of America.